An album of delicate playing, strong emotion and beautiful harmonised playing and singing. What more could a listener ask from an album. Not much, really. 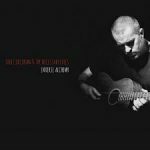 For the most part this is a collection of fully realised folk songs that weave their spell in intricate and intimate ways. ‘Black Hearted Man’ is a case in point – simple plucked guitar figure, gorgeous fiddle underscoring a deft lyric delivered in broad Dublinese and a feather light harmony. Lovely. ‘Train Songs’ has a classic narrative based on harmonica and a gentle walking blues shuffle. The lyrics are knowing and melancholic and as the tune gathers pace the production effortlessly slips in the instrumentation with the lonesome harmonica taking the bridge where the fiddle may have taken it in another song. ‘Ringing That Bell’ brings a darker hue to the palette and a sense of menace not otherwise apparent in this melodious and melancholic album that is nonetheless soothing and perhaps even restful. Indeed this track might indicate that if the album lacks anything it is perhaps an immediacy or sense of hard felt emotion. That said this is a beautifully crafted collection of songs that will undoubtedly double in power in a live situation and reward repeated listening. A fine collection of modern folk songs beautifully realised.